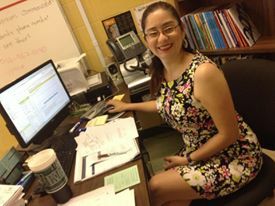 Hi, I am Mrs. Garcia, I am a mathematics teacher. I enjoy working with students and showing them the beauty of math. I have been teaching for 9 years. I worked at Stell Middle School for 6 years where I taught 8th grade Pre-Algebra, Algebra 1 and 6th grade Basic Math. I am currently teaching at Pace High School different classes such as Pre-Calculus, Algebra I, Algebra 2, Geometry, HB5 college Prep, and dual enrollment courses. Classroom Teacher Certification grades 4-12. Master's of Science in Mathematics from UT-Brownsville in 2015. Bachelors of Science in Mathematics from UT-Brownsville in 2006. General Associates Degree from UT-Brownsville 2005. Currently working on School Administrator Certificate and I am doing my intership at Pace HS. Students are required to bring the binder to class everyday. At the same time students must bring a black or blue pen, a pencil and eraser at all times.